If you’ve ever wondered what to do with them, today is your lucky day. We’re going to make enchiladas. We’ll probably also make a fine mess in your kitchen. It’s gonna be totally worth it. 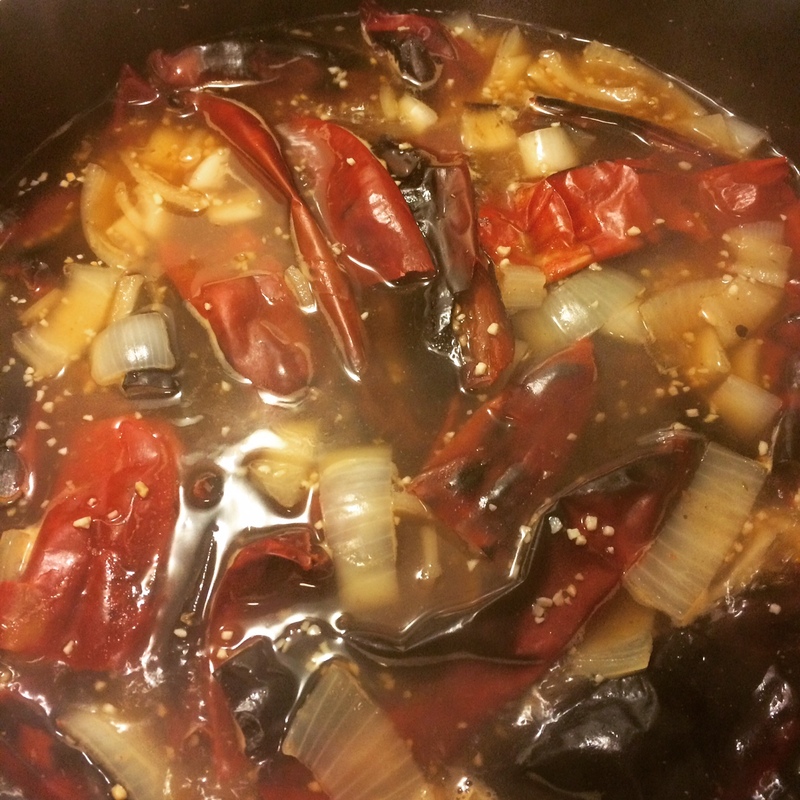 Some people have recipes for chiles where you use combinations of different chiles to create a sauce. 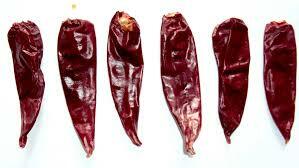 Living this close to New Mexico we have access to some spectacular chile so I always go all red Hatch chile. Don’t let me stop your from experimenting but there’s something about New Mexico red chile that is indescribable. It’s not just the heat, but the earthy richness and the floral scent. So…yeah. Let’s do this. I used about a dozen individual chiles. Give them a good rinse first because it’s not unusual for them to be a little dusty from the field. I cut the stems off mine, dumped most of the seeds out (a few seeds in your food is ok, it gives your dish a little life they say) and chopped them in to a few pieces. I like to toast them in a dry skillet for a bit, until they just start to get fragrant, after I rinse them. You can skip if you want but you’ll miss out on the really deep, complex flavor of red chile. Once toasted dump them, along with a roughly chopped yellow onion, a couple of cloves of garlic, a tablespoon of oregano and a tablespoon of cumin (easy on the cumin if you’re not sure) in to six cups of water and bring it up to boil. Once it hits a full rolling boil, turn the heat down to a simmer and put the lid on the pot for about half an hour. You want everything to get good and soft. While everything is boiling preheat your oven to 350. 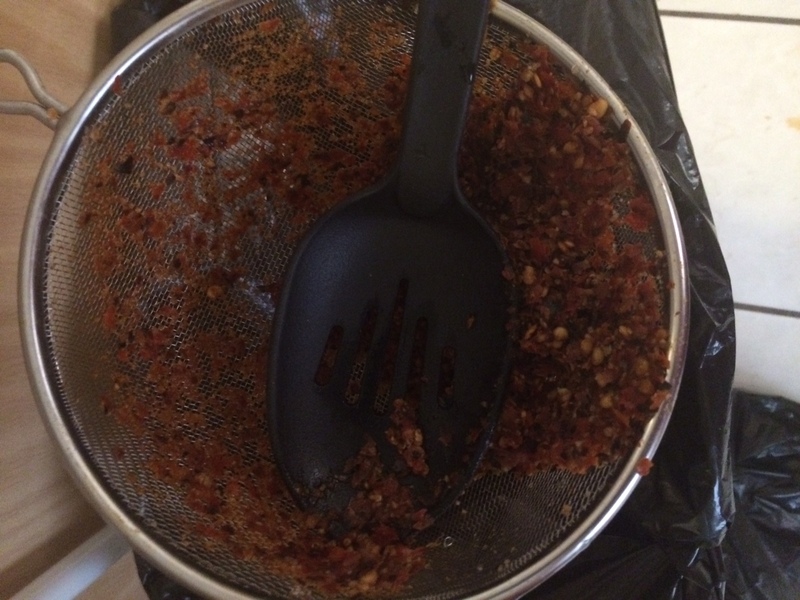 Thats the skins and seeds of my chiles on the left, hovering above my trash can and the resulting sauce on the right. 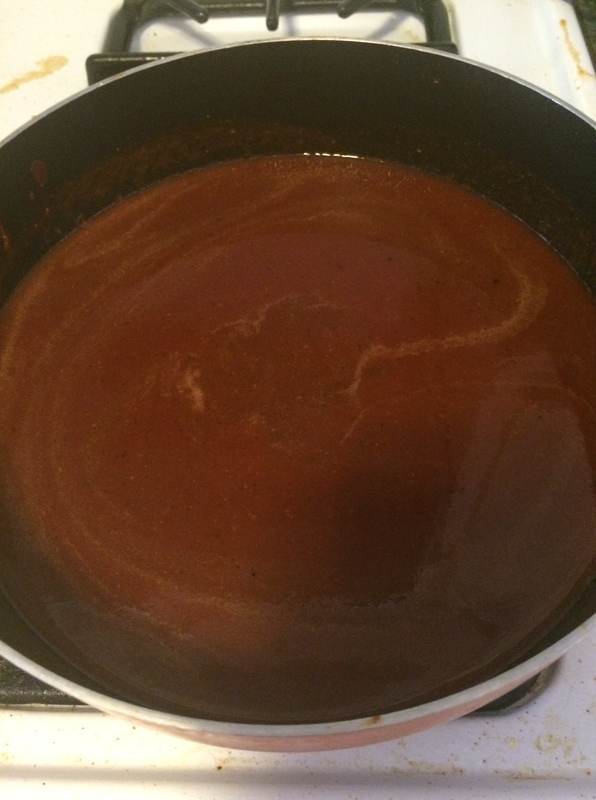 You’ve just made red chile sauce. You can stop here if you want. Red chile sauce is great for lots of things. It can be frozen and saved for later or you can home can it in a mason jar. 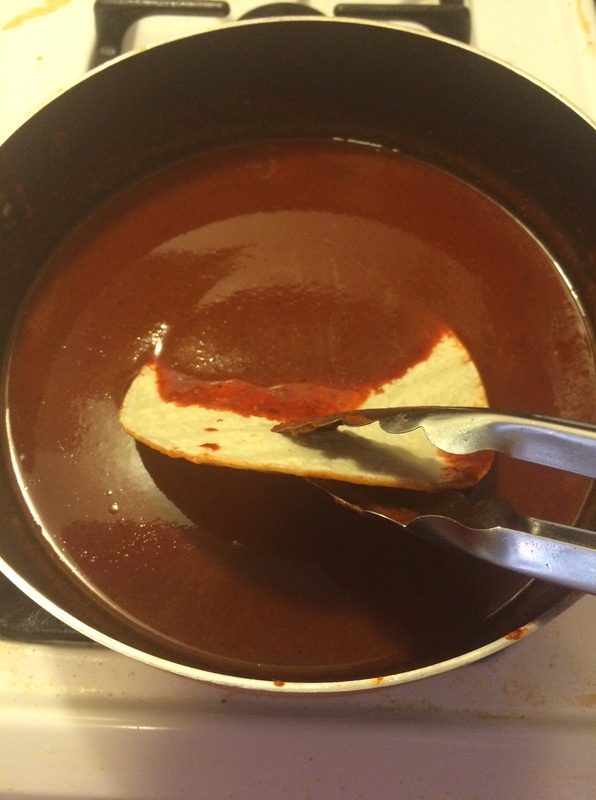 The sauce is great for making pozole, tamales, chilaquiles, chile colorado, or even just bathing a burrito in. Now is the REALLY messy part. You’re going to want to set up a little assembly line here with corn tortillas, a pan to fry them in, your sauce, your filling, and the pan you’ll bake them in. Put about two fingers of vegetable oil in a skillet. This is the trickiest part. You’re going to need to fry a corn tortilla (DO NOT USE A FLOUR TORTILLA FOR THIS). Getting the temp right is hard. If it’s too low, the tortilla soaks up all the oil, gets soggy and will fall apart. Too hot and you’ll smoke up your kitchen or fry the tortilla solid. Ideally you want the oil just a little under the smoke point so that it only takes a few seconds on each side to fry your tortilla. Take a corn tortilla out of the package, dunk it in the sauce (the sauce doesn’t need to be heated for this), enough to coat both sides. There’s two schools of thought about the order. Some people fry first, then sauce. I’ve always heard sauce first, then fry because it cooks the chile into the tortilla. I’m starting to get doubtful about this. I think you season your oil more than anything else. I’m going to experiment with frying first next time. Buy more tortillas than you need, you’re going to lose a bunch. Just solemnly nod at these lost tortillas and move on. They got ruined in service to something delicious. Then, take your sauced up tortilla and fry it in the oil, flipping once and removing it. 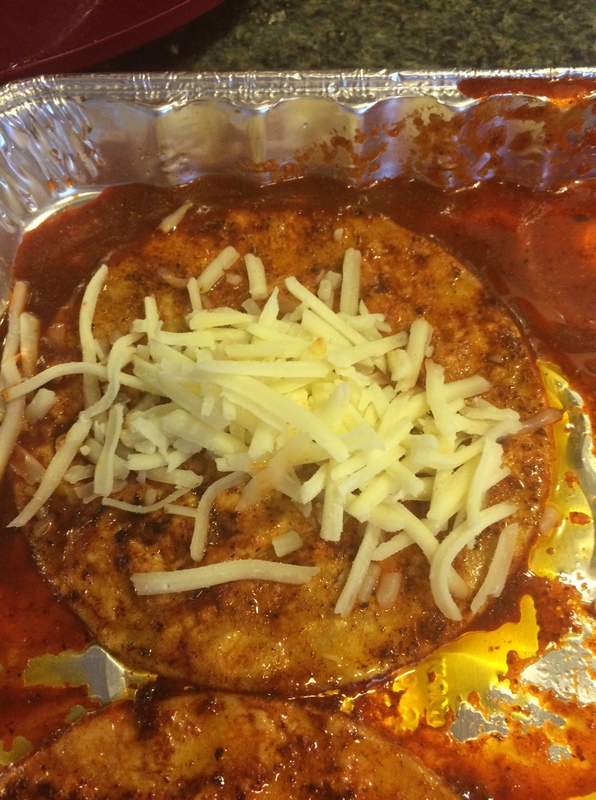 You want the tortilla to form bubbles and puff up a little on each side. Once both sides are fried, move it to you pan. Dump some white cheese in that dude and roll it up, placing it seam side down. Your hands are going to be covered in red chile. It stains easily and doesn’t wash out so much as gets bleached out by the sun, so be careful with your clothes. You’re kitchen is going to be several shades of New Mexico red and grease splattered. This is part of the process. Enjoy it, because it pays richly. I’ve sauced up the bottom of the pan a little. This is optional and doesn’t make much difference I don’t think. White cheese vs. yellow cheese is kind of a personal preference. I’m ride or die for white cheese, personally. I usually go with either muenster (a local favorite) or a soft Mexican cheese like queso blanco. You’ve got a lot of control over fillings. I usually stick to either cheese or ground beef. If you want to go ground beef, fry up some lean ground beef, add just enough red sauce to make it bind and shovel in queso blanco until you get a thick paste. 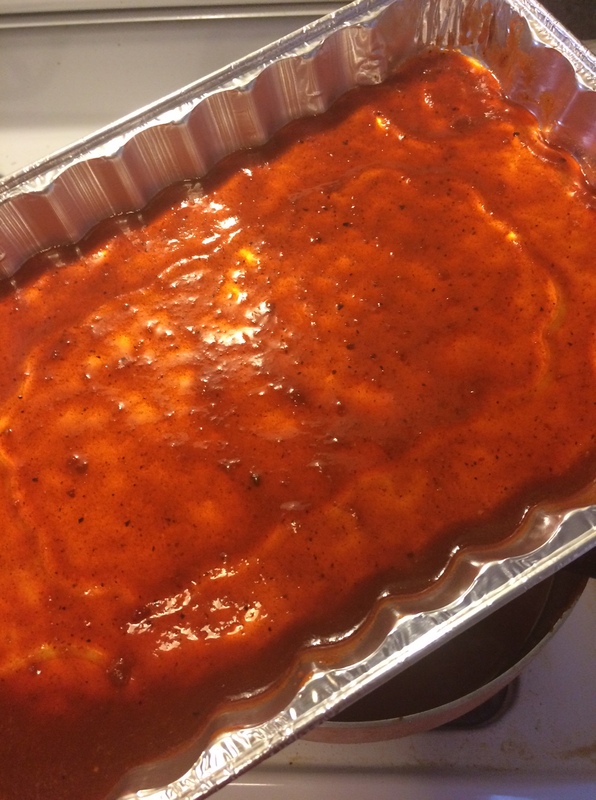 Once you’ve got all your enchiladas rolled and laid down all Kentucky, pour the remaining sauce over the top and kinda half heartedly move it around to coat everything with a spoon. You can top the enchiladas with more shredded cheese, or a crumbly white cheese like queso fresco (sorta like a milder feta). Queso fresco and queso blanco don’t melt, but they get more delicious in the heat. 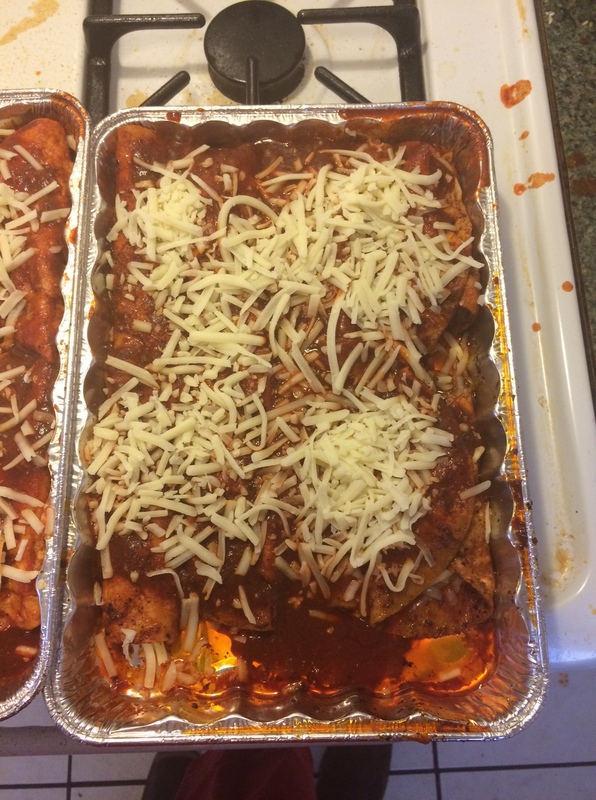 Pop your enchiladas in the oven for 20-30 minutes, until everything is slightly browned on the top and bubbling around the edges. Enchiladas are great for lots of things. Especially turning your entire kitchen red. They’re a traditional lenten food when filled with cheese and a hearty dinner when filled with meat. If you topped yours with queso fresco a little drizzle of table cream across the top when you plate them is going to make you want to lick your plate like some hungry cartoon bear. If you topped them with shredded cheese why not go all the way into decadence and top with a fried egg? You can serve them with rice and beans. Or scrambled eggs. Another great thing to serve with enchiladas is a steak. Something about the marbled, salty steak and the rich, deep flavor of chile go together so well that enchiladas and steak will replace thanksgiving dinner as you go-to fantasy meal. Cut off a piece of steak, spear a chunk of enchilada and drive them into your face.You’re not eating like a king, because they eat boring stuff. You’re eating like someone who scoffs at kings and rides raging stallions across the desert. You’re eating like someone who knows that sometimes to have something really good, you’ve got to really mess up your kitchen. 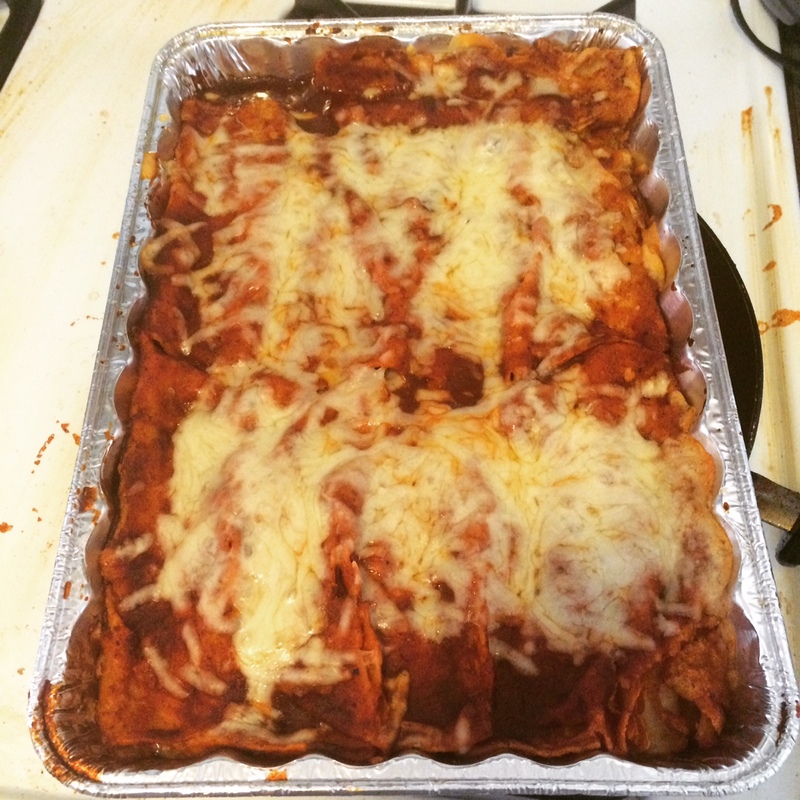 Posted in Food and tagged enchiladas, lent, Mexican food, New Mexico, red chile, red chile sauce. Bookmark the permalink. When I was a kid in school, we were taught about Peter Hurd the artist. I randomly found this album he made on Spotify the other day. I had no idea he was a musician too. And cataloging an under appreciated folkloric tradition too! Posted in Music, New Mexico and tagged corridos, New Mexico, Peter Hurd. Bookmark the permalink.